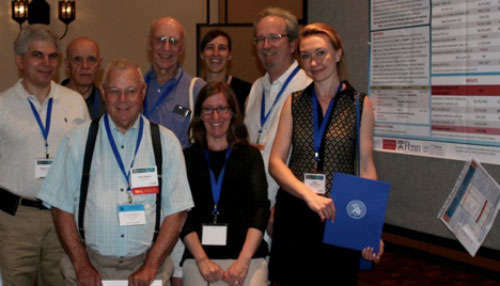 Colleagues and judges congratulate Tatiana Yaroslavtseva, Russia, for her award for the Best International Research Poster at the joint NIDA International Forum/CPDD International Research Poster Session. Pictured from left (back row) are Evgeny Krupitsky, Russia; Edwin Zvartau, Russia; George Woody, University of Pennsylvania; Suzanne Nielsen, University of New South Wales, Australia; and Steven W. Gust, NIDA International Program. In front are Clyde McCoy, University of Miami Miller School of Medicine; Renee Goodwin, Columbia University; and Dr. Yaroslavtseva. Tatiana Yaroslavtseva of Russia received the 2016 College on Problems of Drug Dependence (CPDD) International Committee Award for Best International Research Poster for her presentation, “Fatal Overdose in Recently Detoxified HIV-Infected People Who Inject Drugs in St. Petersburg, Russia—Role of Naltrexone?” She will receive 3 nights’ accommodation at the CPDD conference hotel in her choice of 2017 or 2018. The two semifinalists were Juliana Mejia-Trujillo of Colombia for her poster, “An Experimental Evaluation of a Brief Preventive Intervention,” and Mohammad Muslim of Indonesia for his poster, “HPTN 074: Density-Based Analysis to Identify Spatial Aggregation of Eligible PWID in Jakarta.” The CPDD International Committee created the award to encourage scientists from low- and middle-income countries to present their research at the joint NIDA International Forum/CPDD International Research Poster Session. The research must have been conducted in the author’s home country or another low- or middle-income country. Suzanne Nielsen, Ph.D., University of New South Wales, Australia, chaired the poster contest subcommittee, soliciting entries, accepting PDF entries, and compiling judges’ evaluations. The subcommittee received 21 entries from 13 low- or middle-income countries, with 3 entries each from researchers in Brazil, China, and Russia. Before making a final selection, the judges asked the three semifinalists to give a brief oral introduction to their posters.